Voila, I’ve used the last bit of Yoda in me to write that intro. Wait, don’t tell me… you don’t know who master Yoda is? I’d show you, but I can’t use any copyrighted images. Nor have I a clue when I can use a picture and when I can’t. It seems I’m writing this post on a Friday. This means that the weekend is at our doorstep fellow mainframers, readers, mom, dad, uncle and aunt Eugene. 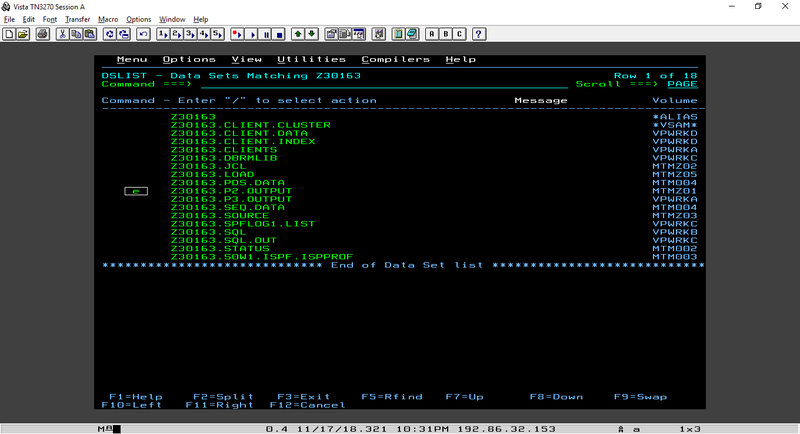 This also means that you have some extra time to read this blog and learn something more about z/OS data sets. Hmm… wait! I’ll release this on a tuesday, darn it. I tried! Challenge #07 – Data Sets, let’s dance! This challenge is all about data sets. It still feels weird to write it like that, I used to write it as dataset. I just double checked and both are gramatically correct. Not important! OOH! Guess it’s time to watch lecture 11! Be right back after the break! z/OS Communications Server Developer Joshua Bennetone first covers the basic data set naming rules. Data set segments are easily comparable to how domain names work in webdevelopment but in reverse order. DEPT58.SMITH.DATA3 for example. High qualifier is DEPT58, Middle-level Qualifier SMITH and low-level qualifier DATA3. There are some other rules but let’s keep it simple, for now. z/OS reads data records differently than other systems. They don’t manage data records as a stream of bytes. Unlike the way streams are dependentent on ASCII CRLF, z/OS records are assigned a length. Records carry a record format attribute. Fixed (F), Fixed Block (FB), Variable (V), Variable Block (VB) and Undefined (U). 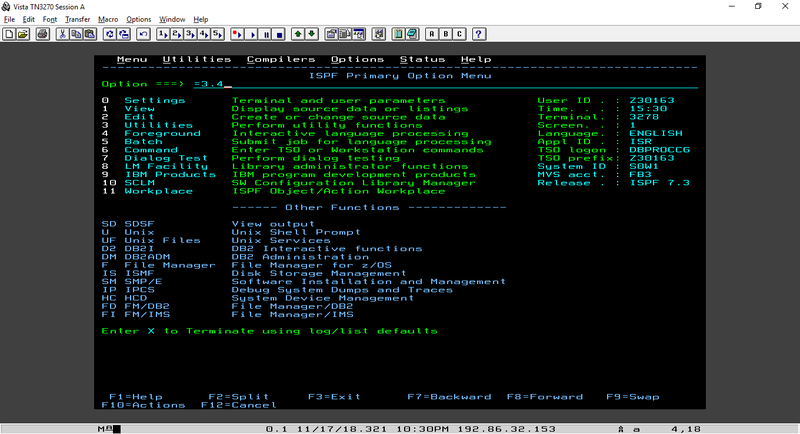 More info at z/OS Basic skills. But nonetheless interesting! There are three types of data sets. Sequential, a collection of records. Partitioned a collection of members where the members contain records. 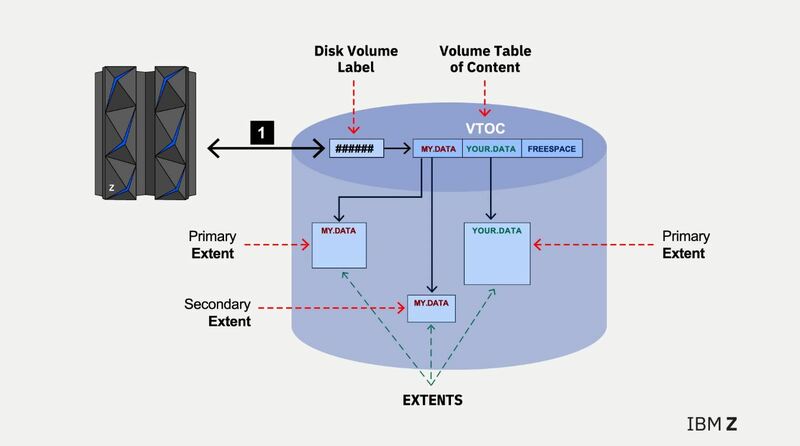 VSAM, Virtual Storage Access Method, provides the flexibility to organize records in four unique types designed for high speed and high volume access to data. Almost there! Phew. Time for another lecture video 15! This video is about how z/OS manages data on disk volumes. 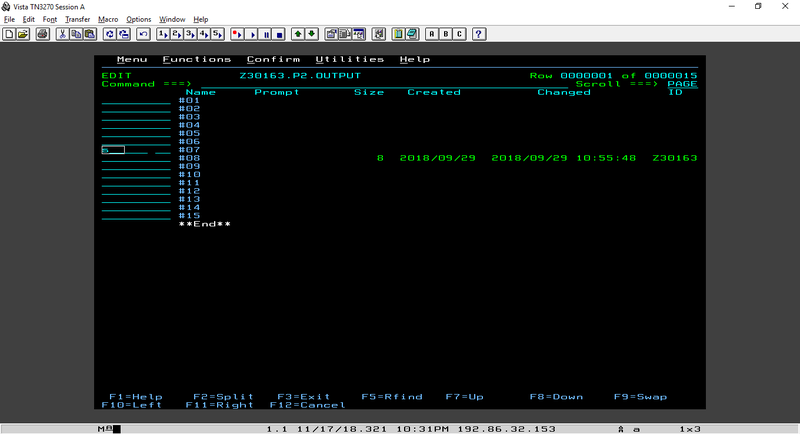 The IBM Z is connected to the disk storage controller using fiber optic channel. The OS knows the Disk Volume Labels and the respective Disk Device Address. 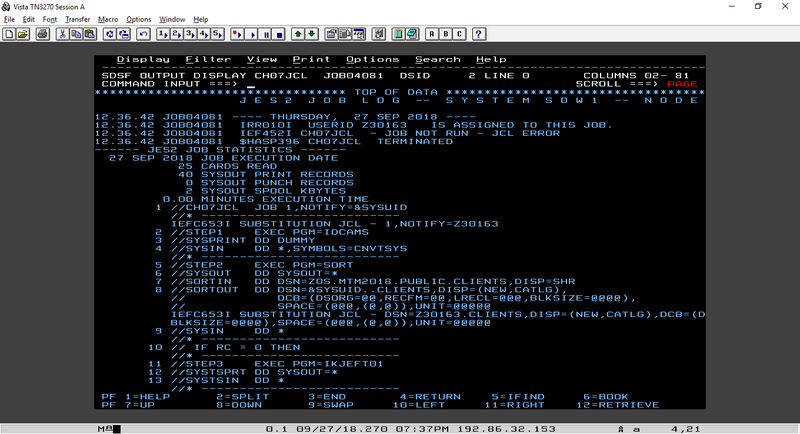 The Disk Volume Label knows the location of the disk storage VTOC. 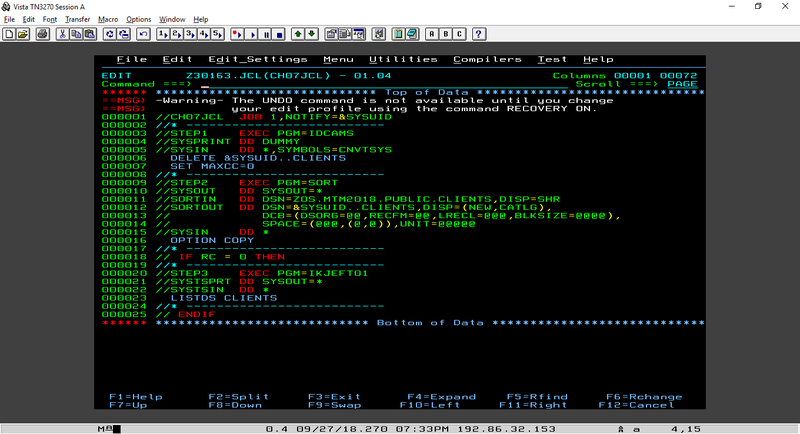 The VTOC maintains the table of the data set names and freespace of that disk storage device. In the case of MY.DATA, the VTOC knows the starting and ending location of the primary extent. All data have a primary extent that contain data. If the primary extent is full then a secondary extent with a different starting and ending location gets created. YOUR.DATA only has one primary extent. An extent is a contiguous area on the disk storage device. 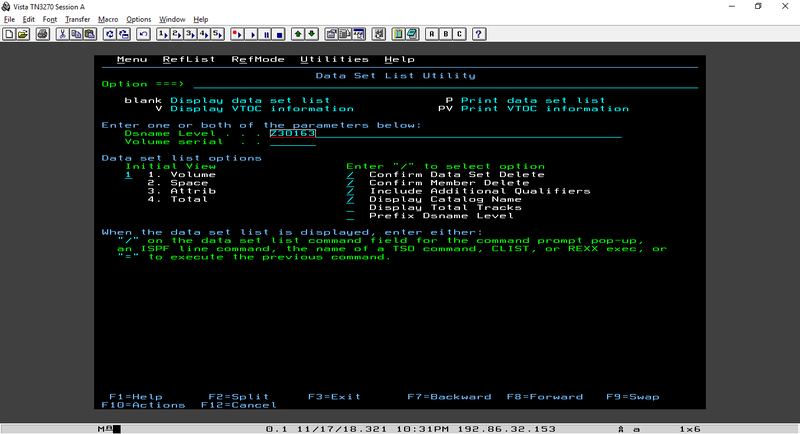 There are several ways to create new data sets like the ALLOCATE command, using JCL, ISPF menus or other access methods. I’m given a JCL script with 3 EXEC statements. Each statement can be seen as a JOB step. Line 000003 is STEP1, 000009 is STEP2 and 000020 is STEP3. Don’t forget, you can read the entire error by moving to the right using the right <number> command. This allowed me to read the entire error. I’ll highlight where it goes wrong. I need to replace the @ symbols with data set name attributes in order for the script to run successfully. I’ve used the DFSMS knowledge center page as a guide to understand the parameters better. To be more specific, the page about Absolute Track helped the most. JOB04165 successfully completed! Now just to write the output to member name #07 in P2.OUTPUT. Yarr! Let’s copy the output! Yes it was copied! WOW! This post is a thousand words long! Imagine if I was paid per word… Also, I’m sorry it took a week for me to release something. Been busy! 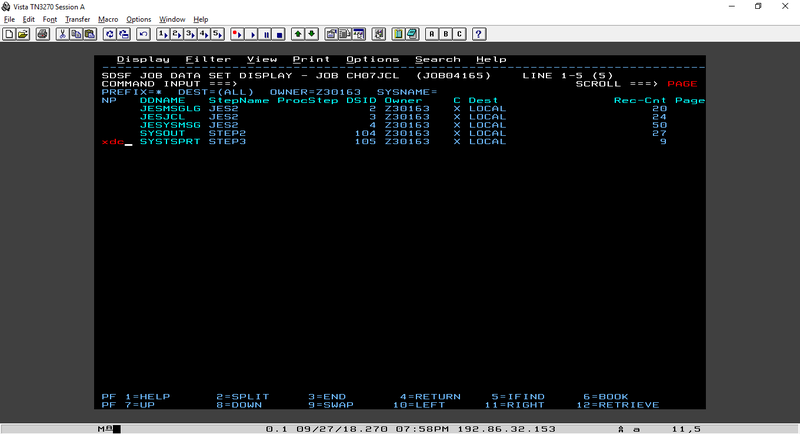 Took a sneak peek at challenge #08 and it’s about bits, bytes, hexadecimal, EBCDIC, and ASCII. Interesting! I’m glad to see I have another reader, I’m happy to have you! I hope this blog helps you a bit through IBM’s Master the Mainframe contest. Realllllly stupid question but how did you view the P.2 output in that last screenshot? i feel like i should know this by now lol. Like everything else went right and i tried to mess around in the data sets but i couldnt find how to see if it copied. No problem, glad I could help! I’ll update my answer with some images for any future Googler 🙂 Goodluck with the challenges! I execute it with submit ; =sd ; st, I got job number, but unable to see this job in the list, so unable to check it. I am unable to find SYSTSPRT in job. Hi Akos, that is probably because the job didn’t execute successfully. Are you sure you did everything right? Yes, I issued sub ; =sd ; st, it seems successfull, I got job ID too, but it is unable to find in list of jobs.